Today I’m going to do something a bit different. Instead of featuring dogs and cats available for adoption, I’m going to feature horses, cows, and other farm animals. Sometimes we forget that these animals often end up in shelters and need great homes, too. The first two animals I am featuring today are horses, Shila and Aspen from Pets Come First, Inc. in Centre Hall, PA. Shila and Aspen are blind and were rescued from a cruelty case. They are unable to be ridden, but, would still make great companions. Aspen is a 10 year old female and Shila is a 9 year old Paint / Pinto female. 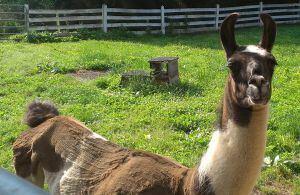 Next is Zelda, a llama from Southeast Llama Rescue in Lancaster, PA. Her post states that there is not much known about her at this time, but, once she is evaluated there will be more information. She was surrendered along with two other llamas, Ebony and Montana. They would like to keep the three together, if possible. Mr. Bubbles is an adult, male, farm pig from Lollypop Farm, Humane Society of Greater Rochester, NY. Marley is a sheep from the Humane Society of Ohio Valley, in Marietta, Ohio. 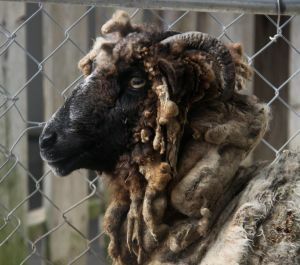 She is a two year old Navajo Churro Sheep with an awesome dread-lock hairstyle. The next animal is Norman, who is a Holstein Steer. He is one-and-a-half years old and as sweet as can be. He is well-socialized and would love a home with other animals. He walks well on a lead and loves his chin rubbed and scratched. Please visit his post or MSPCA at Nevin’s Farm website for more details. The last animal for this edition of Furry Friday is Petunia. She is a farm pig available for adoption from The Humane Society of Wichita County, TX. Visit the shelter’s web page for more information on sweet Petunia. I hope you enjoyed this farm-friendly edition of Furry Friday! As always, Furry Friday is in no way sponsored by any of the shelters or rescues featured or Petfinder. It is simply my way of showing my readers the many animals available for adoption. Posted in lucky dogs (and cats) and tagged animal adoption, animal rescue, animal shelters, farm animal adoption, Furry Friday, goat, holstein steer, horse adoption, llama, pig, sheep. Bookmark the permalink. I am a stay-at-home mom who is passionate about my family, animal rescue, my vegan lifestyle, and leaving a kindness trail in my life. I created this blog to share things that inspire me. 180XT Product Review- Eliminate Pet Odors!